Enter the tiny world of Macro Photography, with the Laowa 60mm 2:1 Ultra Macro Lens. Photo by Tracy Munson. Do you ever drool over photos of exotic places online, but feel like you can't compete? Expensive travel isn't the only way to show your viewers fresh sights and perspectives. I don't care where you live, macro photography is a gateway into a whole new world, right in your own backyard. The Laowa 60mm 2:1 ultra macro lens is a very affordable and competent ticket into that world. Macro photography is about showing the details of tiny things. Often, details that can't be seen with the naked eye alone. 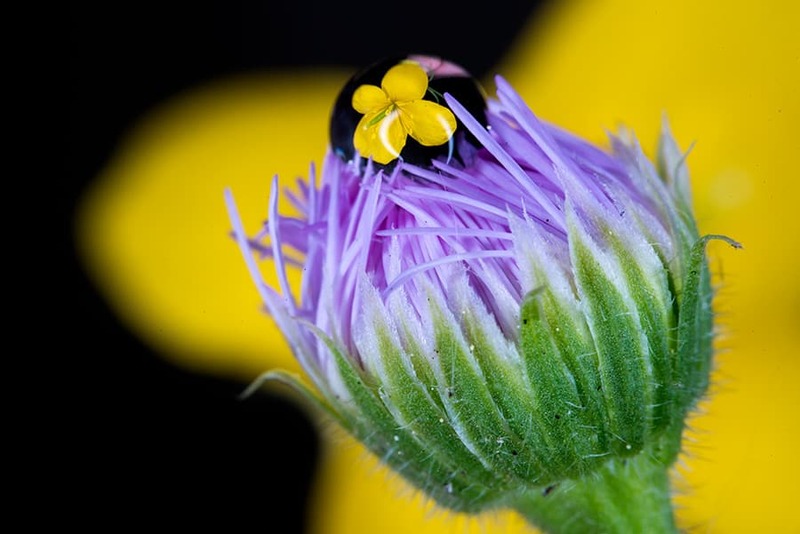 A true macro lens represents a subject in a 1:1 ratio on the camera's sensor. For example, if you take a photo of a flower that is a half inch across, it will take up half an inch on the camera's sensor. A full frame camera sensor is 35mm or 1.37 inches. That means your tiny flower is filling over one-third of the frame. 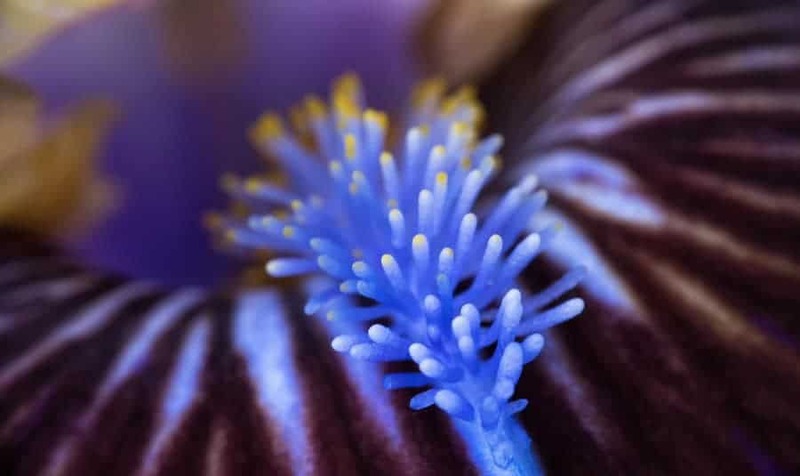 Considering the high resolutions found in modern cameras, you could easily make a 48×36 inch print of that photo, in which the flower is close to 1.5 feet across, without any cropping or enlarging. Think of all the detail that will now be visible that you could never have seen before. That's the wonder of macro photography. The Laowa (sometimes known as “Venus”) 60mm ultra macro lens goes one step further than that. This lens represents the subject in a ratio of 2:1 on the sensor. That means the subject will be twice as large, filling twice as much of the frame – ultra indeed! The lens is available in Canon, Nikon, Sony and Pentax mounts and as far as I can tell, only Canon has a macro offering with even higher magnification. The Canon MP-E 65mm f/2.8 1-5X Macro Lens is a manual focus lens that is only suitable for macro photography and is unable to focus on subjects further away, making it much less versatile. It also costs over $1000 USD. Tiny, hair-like structures inside of an iris. This is known as the beard, and it helps the flower collect pollen from visiting insects. Photographed with the Laowa 60mm 2:1 ultra macro lens, by Tracy Munson. f16, 1/125th, ISO 1600. It's very possible that you don't, but if find yourself bitten by the macro bug, you will probably find that you want one. If you are taking your first, tentative forays into macro photography, there are some very affordable options, like reversal rings, macro extension tubes, and macro filters. Jim Harmer has already recorded a video and written an excellent article outlining many of these options, as well as some popular lenses. You can find that here. The primary disadvantage to filters and extension tubes (and the aforementioned Canon lens) is that you can't focus on distant subjects when using them. This isn't a deal breaker, by any means, but it does mean that they are not ideal solutions for a walk in the park. The last thing you want, when you're out and about, is to have to keep removing and replacing extension tubes, exposing your camera's innards to dust and pollen and moisture every time. A macro lens that can also focus to infinity is a much more versatile addition to your camera bag. Sometimes, you need a single lens that can cover close up shots of a tiny insect on a flower, but also the whole flower, and maybe even the whole garden. In my business, as a Pet Photographer, it can be very useful to have a lens that will still focus as the animal gets closer and closer to you (as they tend to do). People love detail shots, like the texture of the pads of the feet or the nose, but I may not want to carry a separate lens just for those few shots. That's where a fast aperture, decent portrait length macro lens that can still focus to infinity becomes really handy. This is NOT an example of my awesome pet portraiture, obviously! I just wanted to show that sharpness can be acheived with non-macro subjects, as well. The vignetting is also becoming quite obvious at this focal distance, on a full frame camera. Photo by Tracy Munson. f2.8, 1/160th, ISO 800. 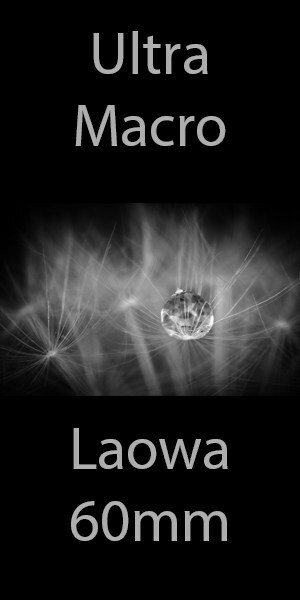 The Laowa 60mm 2:1 Ultra Macro Lens is weighty, with a solid construction. The tiny pink flower bud supporting the water droplet is smaller than my baby fingernail. Photographed by Tracy Munson with the Laowa 60mm Ultra Macro Lens. f16, 1/250th, ISO 200, ring light at 1/8 power. Here's the important question: what is it like using this lens? The answer is, pretty darn cool. Also, challenging. In fairness, the challenges are mostly those of macro photography, not necessarily unique to this lens which is capable of producing sharp photos of excellent quality. Here are a few of the challenges you may find, and some tips for overcoming them. Many photographers are afraid of manual focus, but it is an essential skill in macro photography. The incredibly shallow depth of field (DOF) means that focusing can be a very fussy task. The easiest way to do it is to set your focal distance or desired magnification ratio on the manual focus ring and then carefully move the camera backwards and forwards until your subject is in focus. For extra precision focus, you may want to switch to live view and zoom in to really see what you're focusing on. Aperture isn't the only factor that affects DOF. The closer you are to your subject, the shallower the DOF will be. That means that macro photographers are dealing with a slice of focus that may be fractions of a millimetre (for the non-metric folks, literally thinner than a hair's width). While the f2.8 aperture on the Laowa 60mm may come in handy for portraiture, it will rarely be useful for macro photography. All of the macro photos in this article were taken at f16. Even at those higher apertures, it can still be extremely challenging to achieve enough DOF to have a subject fully in focus. Focus stacking (a technique where you take multiple photos at very slightly different focal plains and then blend them together) may be necessary. 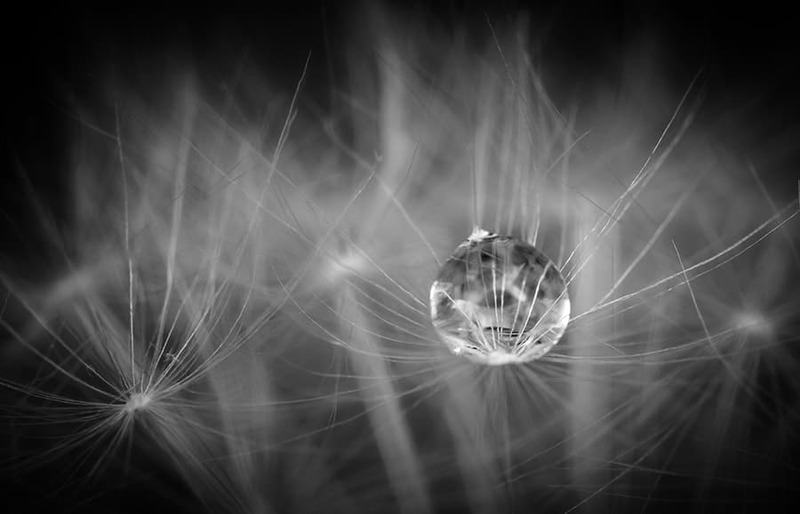 Extremely shallow depth of field in a macro photo of a water droplet in dandelion fluff. Photo by Tracy Munson. f16, 1/400th, ISO 3200. Not surprisingly, when you start closing down your aperture to increase DOF, you will quickly find that you don't have enough light. This is especially true when photographing living creatures which tend to require faster shutter speeds to avoid motion blur. A traditional Speedlight will not help you because the light won't even reach a subject so close the lens (in fact, it will just cast shade on it). You may need a special kind of flash, called a ring light. This type of light goes right around the front of your lens like you're shooting through the centre of a doughnut of light. It provides a very even light on the subject, without creating any shadows. Ringlights can be pricey, but of course, Yongnuo has a very affordable version, and that was what I used in many of these example photos. 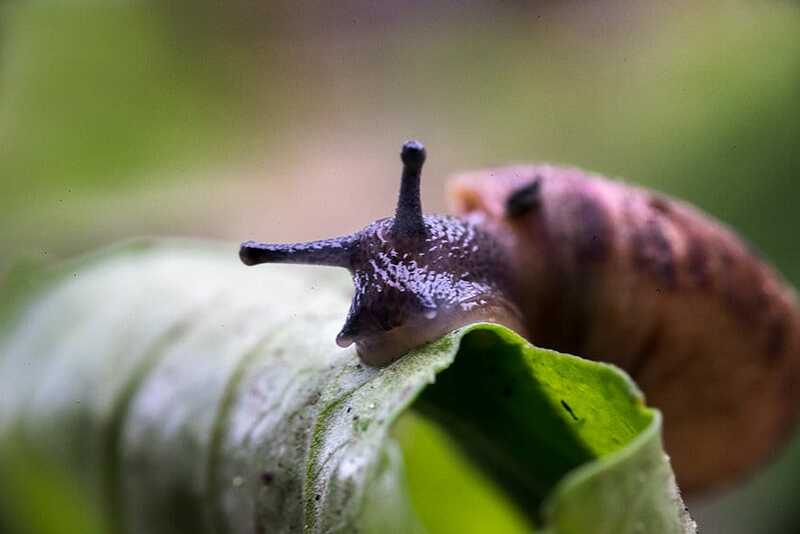 This speedy snail was moving way too fast for me at f16, even after I cranked the ISO up to 3200. Unfortunately, during the time it took me to go inside and locate my ringflash, he “ran” away! You can see here just how shallow that DOF is, even at f16. You will have to take my word for it, but this was a very tiny snail, about half the diameter of a dime. Photo by Tracy Munson. f16, 1/125th, ISO 3200. The Laowa 60mm has a manual aperture ring, which means you cannot change the aperture using the dials on your camera. It also means that you will have less light available through the viewfinder when you're trying to focus. You see, on a lens with an aperture controlled by the camera, the aperture remains wide open until you press the shutter button. Only then, does the aperture snap closed to the selected f-stop. On a manual aperture lens, the aperture will be closed down the whole time, allowing very little light in and making your viewfinder appear dark. If you have a newer camera with live view, you may be in luck. While some older models (for example, my old Nikon D3200) showed the same view on the LCD as was seen through the viewfinder, newer models show a preview of the image cast on the sensor and will be much brighter, even with a closed down aperture. If your camera does not have this kind of live preview, you may be forced to focus with the aperture wide open and then close it down before pressing the shutter. Obviously, this is not ideal and will only work with still subjects and a tripod. 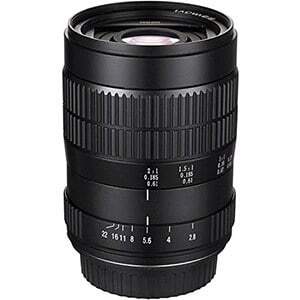 The 60mm focal length means that to achieve 2x magnification of your subject, you will need to get very close. Closer than some tiny creatures will allow. Patience, persistence and luck will be required. Knowing your subjects and their habits can be very helpful. I found this tent caterpillar at work and thought it would be a perfect, relatively slow moving subject. I carried it around in a jar all day. Once I got home, I set it on a leaf in the garden, snapped about 5 photos and then (I swear) it JUMPED off the leaf and into the garden, never to be found. Photographed with the Laowa 60mm Ultra Macro lens, by Tracy Munson. f16.1/200th, ISO 200, ring light at 1/8 power. There are only two real complaints that I have about this lens. The first is that the lens cap keeps falling off. It is a Laowa lens, with a Laowa lens cap, but the cap just will not stay on. The second, which is common to manual aperture lenses, is that there are no aperture clicks. The aperture is easily jostled and changed and there isn't even a click to let you know that it happened. Otherwise, this lens is surprisingly well built for the price point. I will confess that I have had a macro lens on my wish list for awhile. This was not the one I was planning to purchase, but after using this loaner for the past few weeks, I really want to add it to my collection. Macro photography is one of the most fun and accessible specialities I can think of. Everyone has access to tiny, ordinary things that will reveal themselves to be infinitely fascinating upon closer inspection. What better way to overcome a creative rut than to go on a macro safari in your own backyard or nearby park? My own obsession with macro has actually made me happy to encounter insects that used to make me squirm. With my camera as a shield, I'm amazed at what I will get close to! The Laowa 60mm 2:1 Ultra Macro is a solid choice for anyone who is interested in exploring the macro world on a budget, without sacrificing quality or versatility. To see more examples (much better than mine) of what this lens is capable of, visit their gallery here or the flickr group here.